It is often difficult to learn all there is to know about a city , or even tiny village, just by walking around on your own. You will undoubtedly miss some corner with its intriguing story that you would have loved to learn about. A good way of taking a stab at getting to know about these corners and stories is by going on a tour. Typically, most tourist offices offer city walks on a number of themes, sometimes by professional guides, and others by highly interested volunteers from the city itself. Sonderborg is, of course, no less. 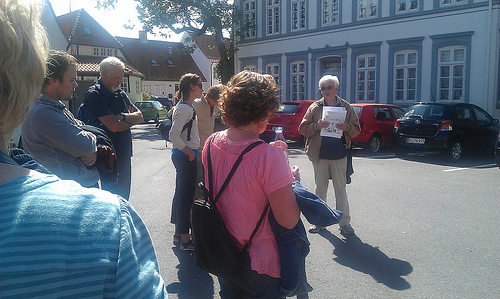 Sonderborg tourist office organises a series of guided walks in the municipality, mainly in the summer holiday period. Among the tours offered there is an 1864 town walk in Sonderborg, a walk around Grasten castle and gardens, as well as town walks in Sonderborg, Nordborg and Augustenborg. Unfortunately for me only the 1864 town walk is advertised as offered in English, with all the others only offered in Danish or German, so I decided to check it out. This walk around the streets of Sonderborg takes you from Radhustorvet, in front of the main Sonderborg tourist office, down to the castle, along the pier and up towards Sct Marie Kirke. During the walk you see locations connected to the 1864 war, learn about what went on, as well as hear stories about the people living in Sonderborg at the time. The walk appeared interesting. However, there was one downside: the languages! The walk was intended to be given in Danish, German and English and on the day I attended all 3 languages were required. Unfortunately, the guide didn’t appear equally comfortable in all of them. This resulted in the walk being around 90% Danish, 6% German and 4% English! If it wasn’t that some of the Danish people took pity on me and translated the main points it would have been very difficult to understand much of anything (thank you family from Blans!). Therefore, if you understand Danish, I urge you to try it out (and come back and tell us how it really is), if you understand German and are interested in it, do check it out (after all my German/Danish recognition is not the best in the world. However, if you only understand English I can only recommend that you not bother with it…unless you get another guide, that is! This entry was posted in Things To Do and Sights and tagged Augustenborg, Blans, castle, danish, English, gardens, German, Grasten, guided, nordborg, palace, Radhustorvet, slot, Sonderborg, tour, town, walk by Ann. Bookmark the permalink.